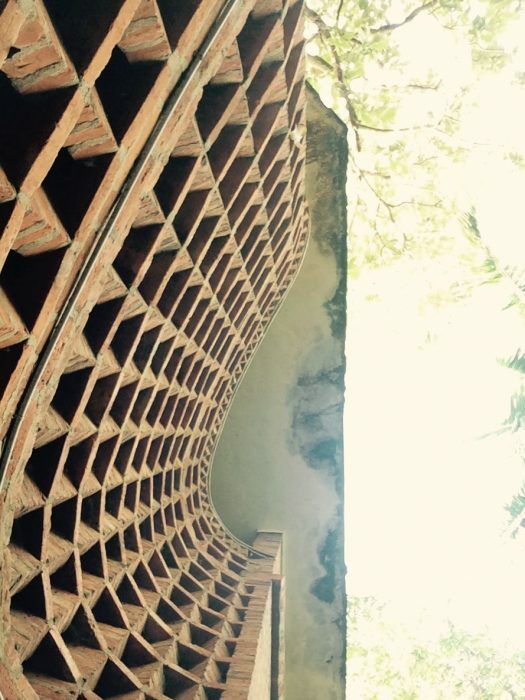 Australian architectural graduate Clare Elizabeth Kennedy discovers the unsung legacy of Laurie Baker's brick buildings in Kerala, India on a six month sojourn to the subcontinent. Here she shares what she saw and learnt. Laurie Baker is barely recognised in international architectural circles. 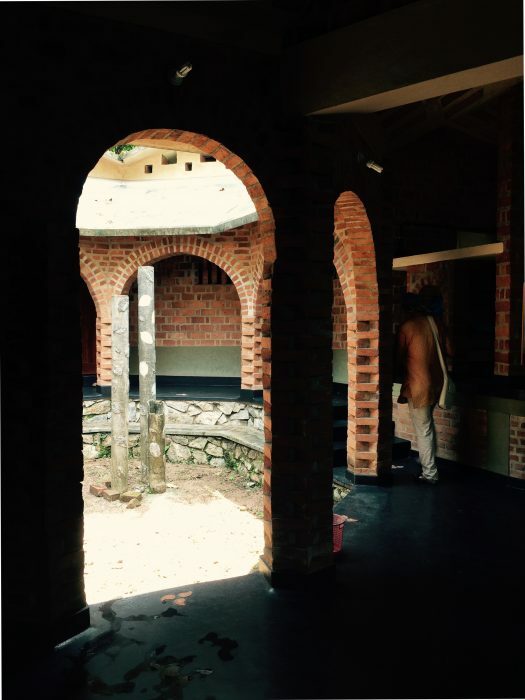 Most of us who have travelled to the subcontinent have fallen in love with his common sense, site-specific approach to building. But for a man who did so much, he remains refreshingly unknown. Laurie Baker was a very humble architect. On his way home from the war he was waiting for a boat in Bombay when a chance meeting with Gandhi changed the course of his life. Born in 1917 Laurence Wilfred Baker became a member of the Royal British Institute of Architects after studying at the Birmingham School of Architecture. During WWII he was stationed in China, where he volunteered with a mission caring for civilian leprosy sufferers. Laurie was ‘doctor’, ‘nurse’, ‘pharmacist’, and even the church pastor on Sundays. On his way home from the war he was waiting for a boat in Bombay when a chance meeting with Gandhi changed the course of his life. 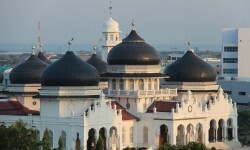 Gandhi sensed that Laurie had a robust English architectural training, but without the ego that sometimes accompanies it. Gandhi begged him to remain in India where low cost housing was of an appalling standard. Laurie was practical: he could build and he had a great deal of common sense. 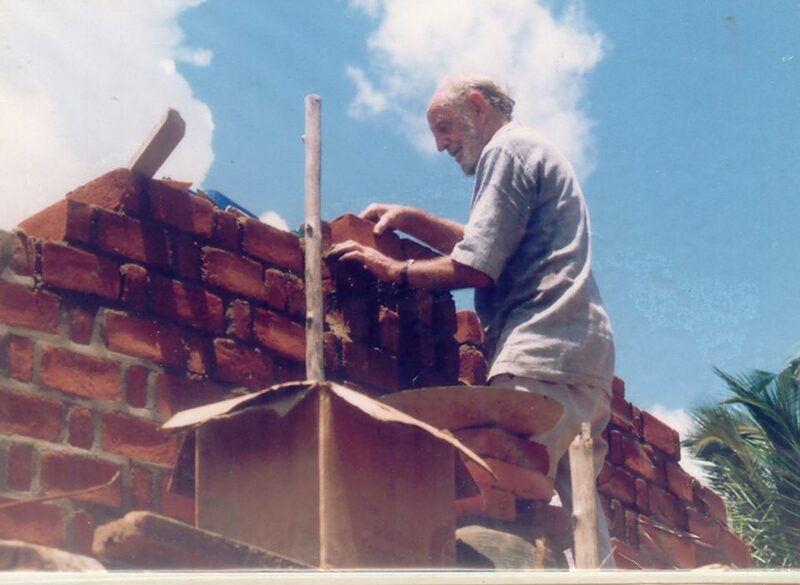 He returned to England, packed up, and moved to India in 1945, where he devoted the rest of his life to building until his death in 2007. 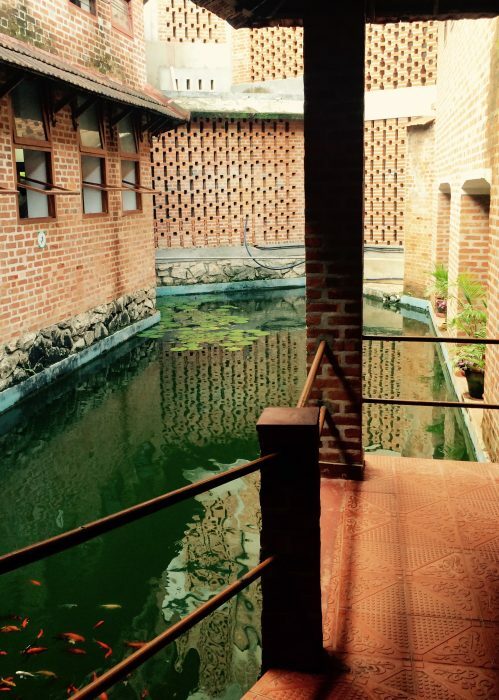 Most of Laurie’s work was in Kerala in South India. He was a prolific builder and the building site was always his office. He didn’t believe in building for classes. Instead he believed in building for people. He built houses, schools, institutes, hospitals, slum dwellings and government buildings — all with a restrained vocabulary of practical building materials. 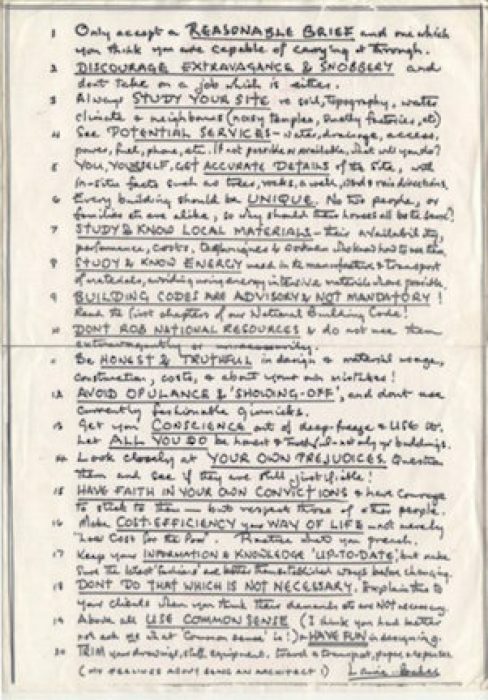 He published his sketches in the form of simple pamphlets aimed at instilling common sense into others and spreading his well-tested building system skills. He was also a wonderful cartoonist with an excellent sense of humour. Over the years his experience on numerous building sites helped him to develop a series of simple principles for building. He believed in thorough and honest site analysis. 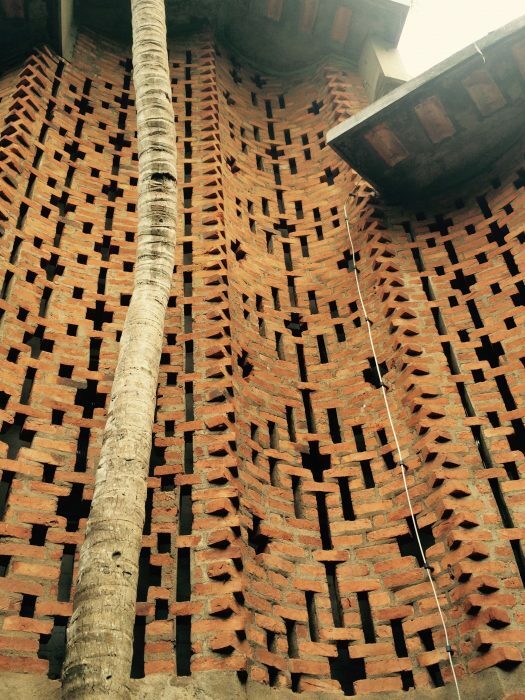 Work with the existing topography and use local materials and local craftsmen. Where is the water? Where is the sun? Keep the trees! Laurie loved nature and believed every building should be a unique reaction to its precise location – a principle we are all taught in first year architecture school then somehow forget in commercial practice. 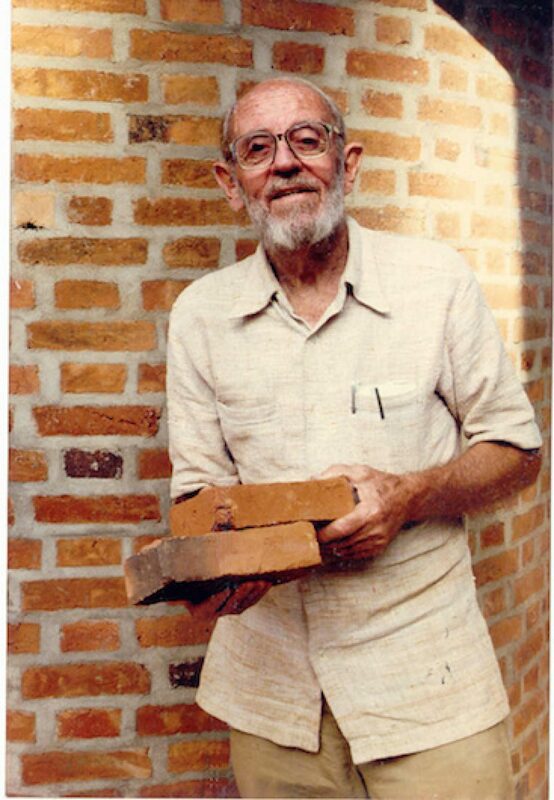 His love of bricks stemmed from something Gandhi had said to him – that buildings should be made from materials sourced within a five mile radius of the site. Intrinsic to his common sense approach to construction was the choice of low cost, locally sourced materials. 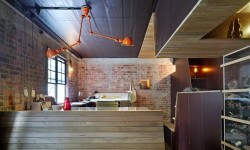 Enter the humble burnt brick. 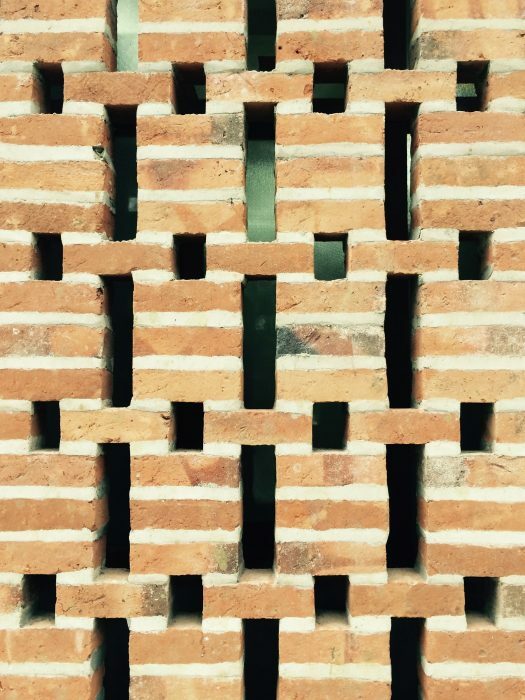 Laurie Baker developed a deep love of the simple country brick, an obsession he experimented with over his entire career, and one which has since earned him the title ‘Laurie Baker - Brick Genius’. 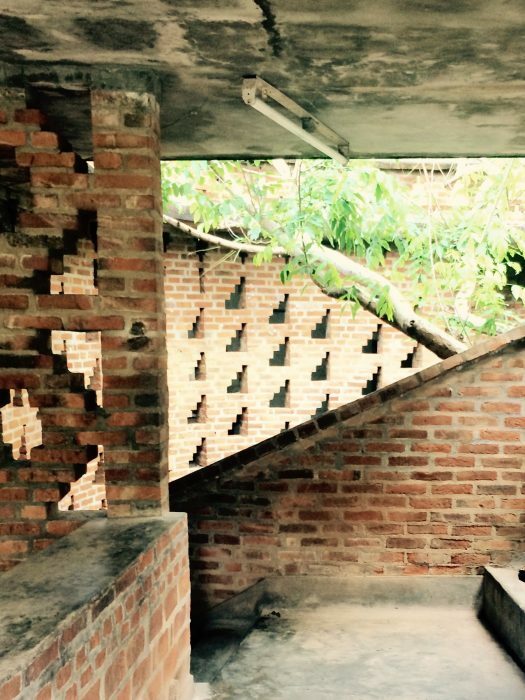 His love of bricks stemmed from something Gandhi had said to him – that buildings should be made from materials sourced within a five mile radius of the site. 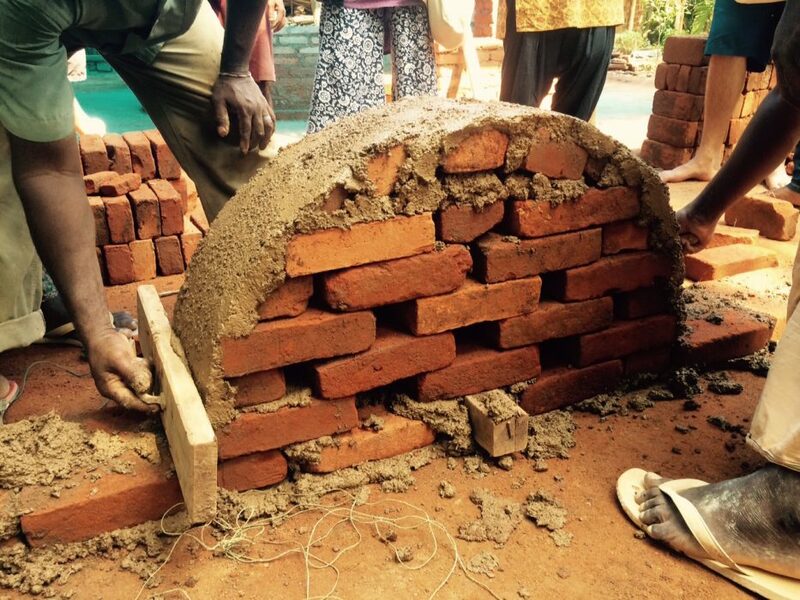 Up until the 1980s it was common in Kerala to use only clay excavated onsite to make good country bricks, however many bricks were required. Five thousand, even ten thousand were moulded using the building site’s clay. These were stacked to form a cube which was then fired, producing reasonably strong red bricks. There was no need to transport materials onto the site, and the hole from the excavated clay became a pond for water conservation during construction. The onsite brick production method was a sustainable, low skilled, and low cost method of construction, and Laurie loved it. 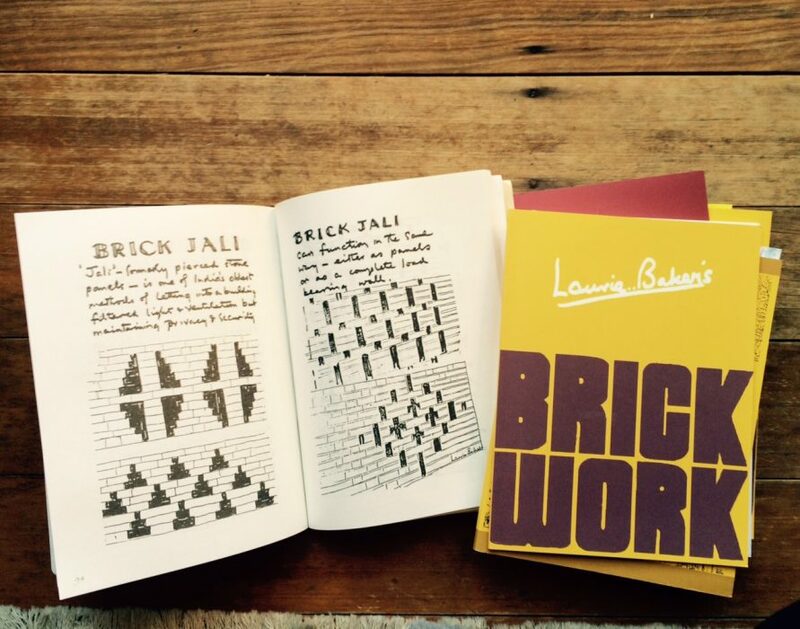 Laurie was incredibly inventive when it came to bricks. 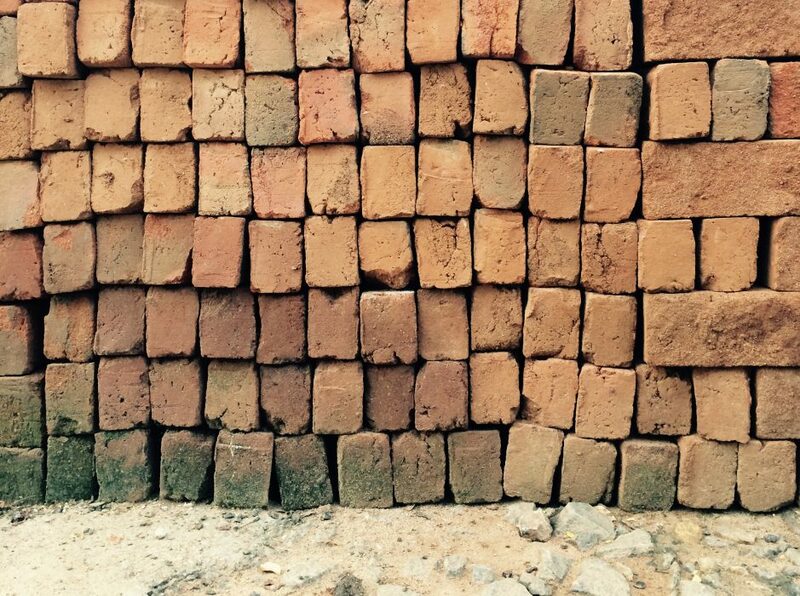 He could always use less bricks to achieve more. 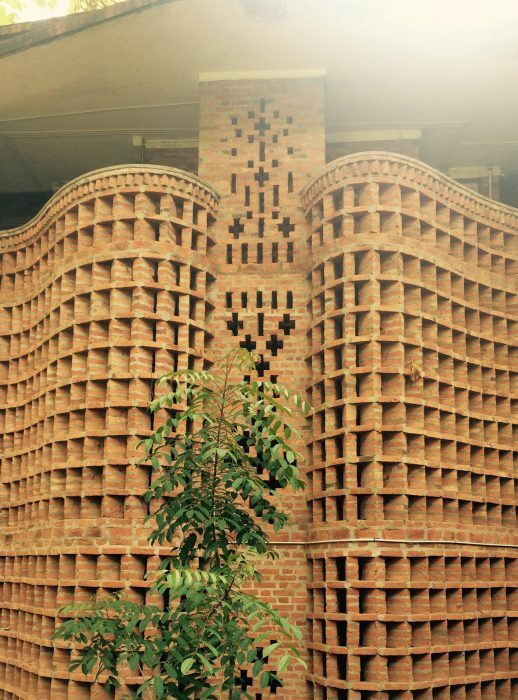 His iconic brick screens — an abstraction from the Indian perforated Jali wall historically carved of stone — served as windows, providing ventilation without the need for expensive glass. He could provide security and privacy while toying with light and shadow. 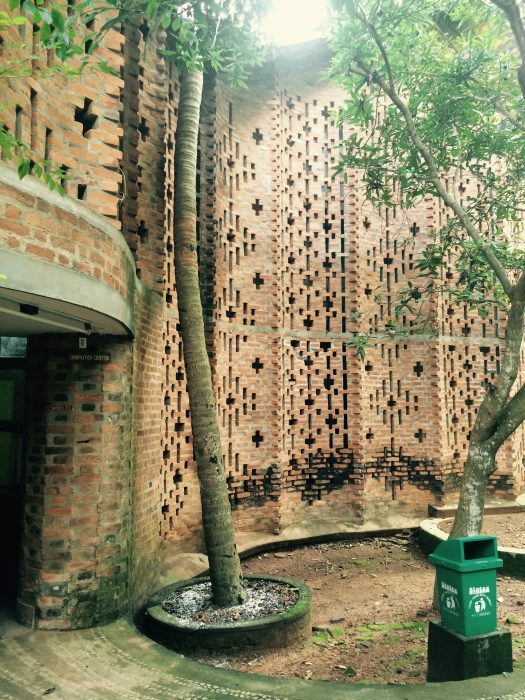 He would bend brick walls in places to create columns to support overhead roofs – negating the need for concrete columns. Similarly, he would always favour an arch or dome above an opening so as to do away the need for added beams and lintels. He was always looking for ways to reduce the amount of material required. 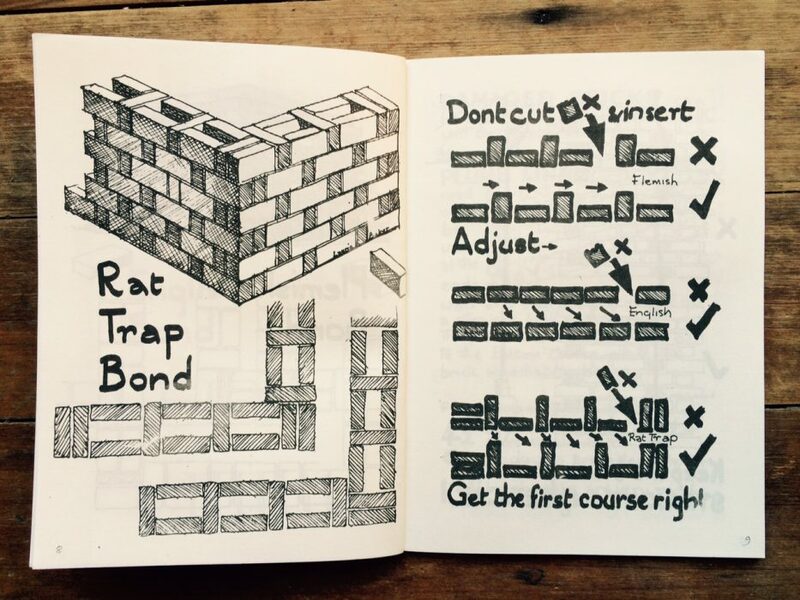 He laid his bricks using a ‘rat trap’ bond — an adaptation of Flemish bond — that uses 25 percent less bricks by leaving a cavity between the wall surfaces. Whenever a concrete slab was required, he would fill the lower portion of it with old roofing tiles or other reclaimed materials to reduce the amount of concrete needed. 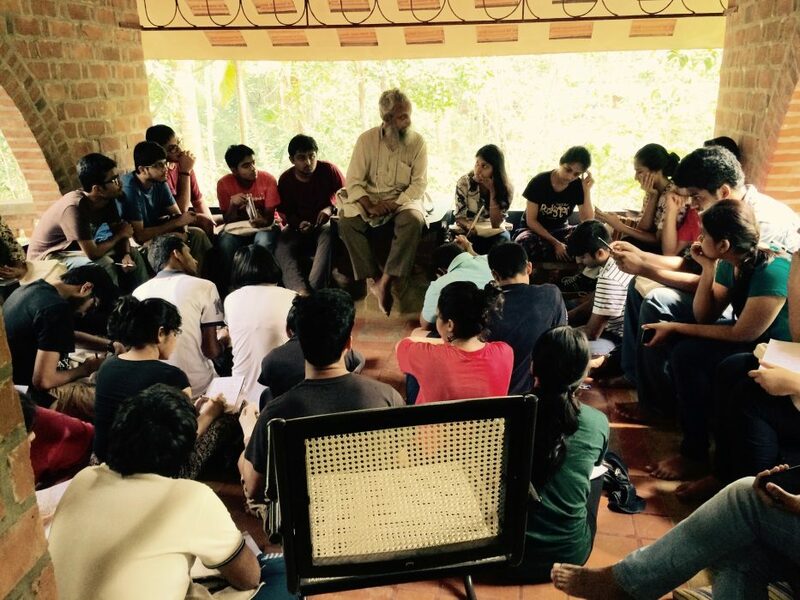 Few people outside India have ever heard of COSTFORD (The Centre of Science and Technology for Rural Development), an architectural practice in Kerala founded by those who had worked with the man himself. Today two organisations continue Laurie Baker’s legacy. 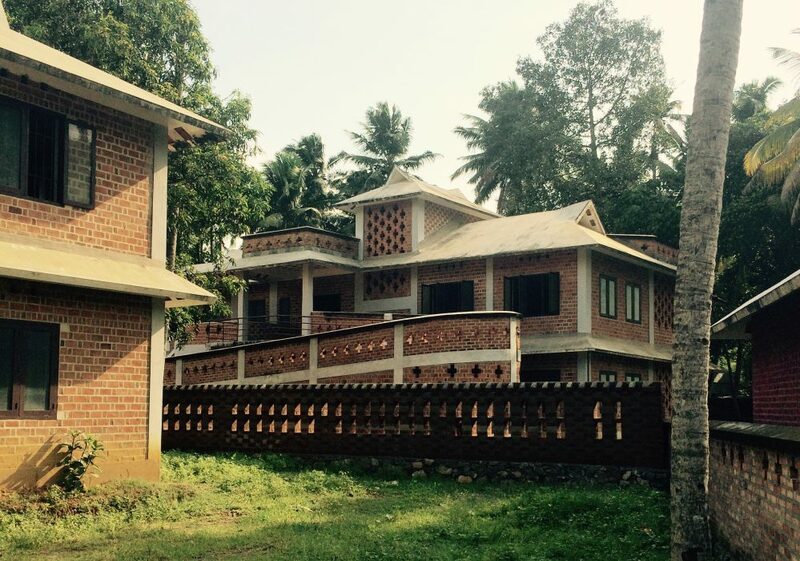 COSTFORD (The Centre of Science and Technology for Rural Development) is an architectural practice in Kerala founded by those who had worked with the man himself. The office is in Laurie’s old house, and few people outside India have ever heard of it. Yet the practice has built over 40,000 robust, low cost buildings in India under very trying circumstances. COSTFORD is a small, humble organisation that gets things done. The buildings cascade down the bank of a densely forested, steeply sloping site. Gentle, simple and strong they look as though have always been there and always will be. The Laurie Baker Centre for Habitat Studies is devoted to education, research and training. They run wonderfully practical workshops that teach people from many walks of life Laurie’s building principles. 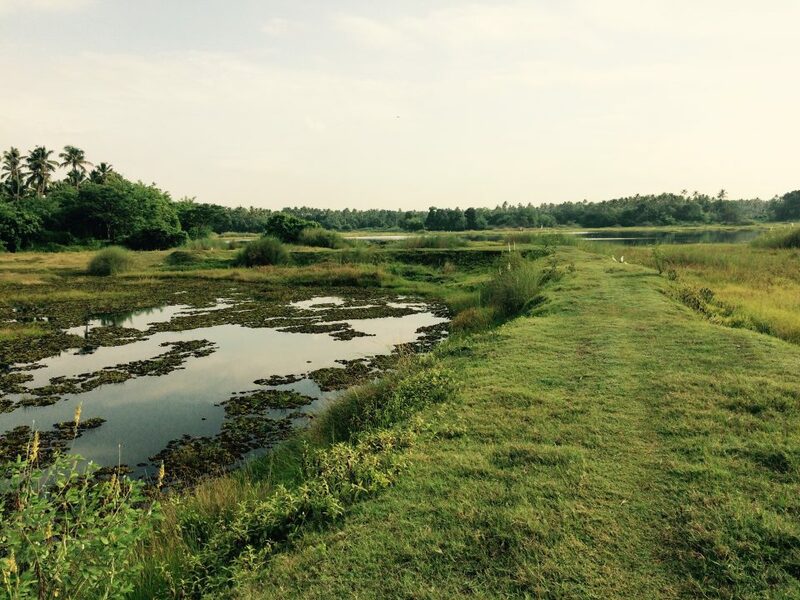 The campus is nestled into the lush hills on the outskirts of Kerala’s capital, Trivandrum. The LBC Campus was one of Laurie’s last initiatives before his death, and it is a magnificent example of his work. The centre’s buildings cascade down the bank of a densely forested, steeply sloping site. Gentle, simple and strong they look as though have always been there and always will be. 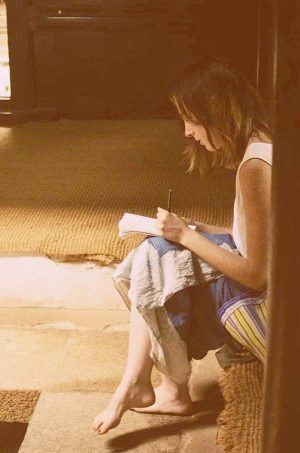 They remind us all that Laurie’s buildings and building techniques will endure. Clare is a Brisbane born architectural graduate who recently returned to her hometown after five years spent working as an architect in London, India and The UAE. Clare has an interest in alternative building materials, having just spent the last six months in India learning and researching various earth techniques. She has recently established her own Dirt Laboratory in an old brass foundry in central Brisbane, optimistic that Australia holds massive opportunity for further earth-based experimentation. Clare has also taught Architectural Design in universities both in the UK and Australia and is lover of architecture schools, students and debate.